No more port-forwarding or waiting for software to network your system for you. Simply download the ClearVu® app, scan the QR code and begin monitoring remotely in seconds. Checking in with Defender has never been easier. Our ClearVu® app keeps you connected to the things you value most, whether you’re around the corner or around the world, in real-time. The included 1TB HDD allows for continuous monitoring and can store over two years’ worth of recorded footage. 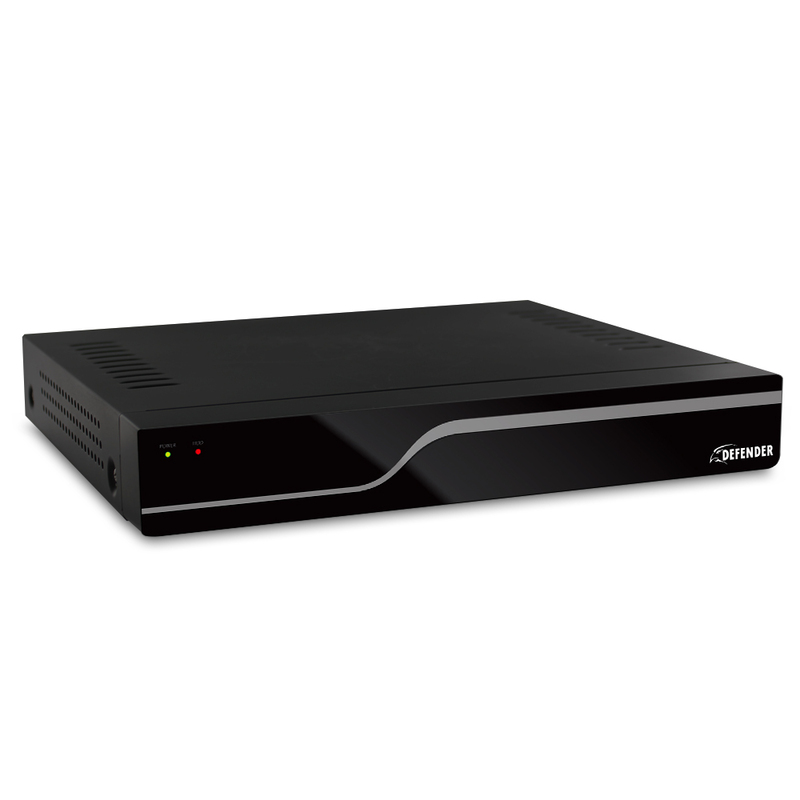 Maximize available memory with motion activated recording and H.264 compression technology. DVR alerts will activate to notify user when HDD is full. Back up and transfer footage to USB flash drive or external hard drive via USB port. Night vision range up to 75ft under ideal conditions. Objects at or beyond this range may be partially or completely obscured, depending on the camera application. e reserve the right to change models, configuration, or specifications without notice or liability. Product may not be exactly as shown. ©2014 DEFENDER®. All rights reserved. DEFENDER®, the DEFENDER® logo and other DEFENDER® marks may be registered. All other Trademarks are the property of their respective owners. Great design and very sturdy product. The system is very simple, and comes with very helpful instructions if needed. There are also countless features and settings available to expert users. My only challenge is the motion detection. Even at the least sensitive motion setting, the unit is chirping, even though nothing is moving in the picture. So I have disabled motion detection. Nice value for the money but I wish it had zoom. Picture not clear so can't see face or zoom in to see face. Mounted easy, motion setup easy & playback. You have to have at least a basic understanding of how to setup networks to install this product. It is advisable to move everything else in your network to a different frequency like 5 GHZ to avoid conflicts with Defenders extensive use of the 2.4 GHZ band. What do the files save as. The online instruction manual was helpful in setting up the system. There could have been more detailed instructions in using some of the features (backup). Viewing the online videos was helpful. It is best that you make sure that everything is working before actually mounting the cameras. Setting up the networking is not easy. Michelle did a great job to help me set up app for my phone. He knew exactly what to do. I purchased this item because we were having problems with a bad neighbor. The product works well and we were able to clearly view events; even at night. It was easy to setup and has very user friendly menus. 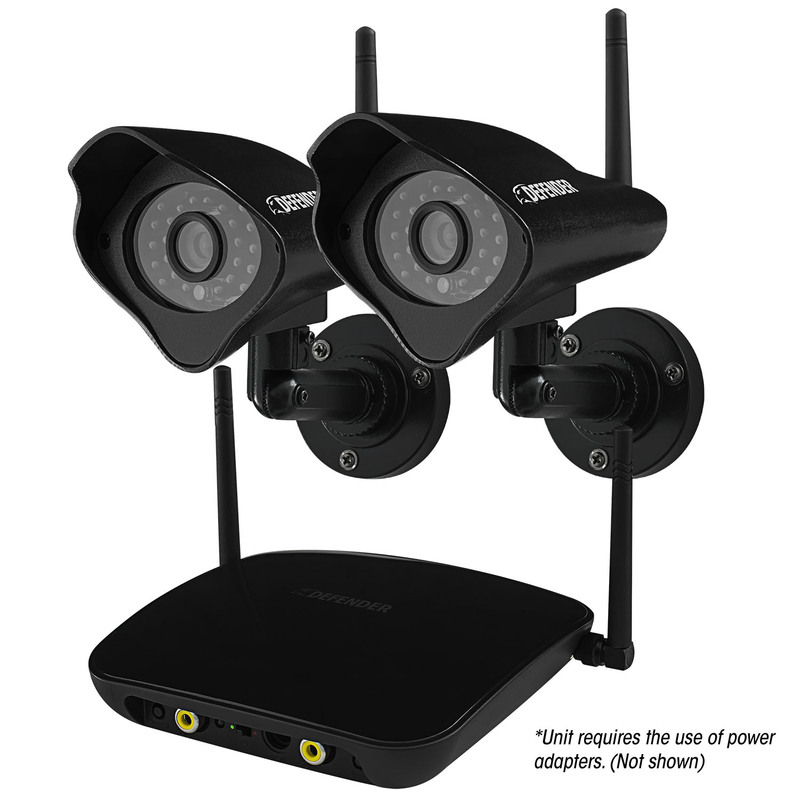 I installed this system and even purchased two more cameras to go with it. Everything worked perfect if the cameras are in our home but when outside the range can become a problem. I put one inside of a detached garage which is approximately 120' from the receivers which are in our home. The signal would have to go through two exterior walls and then a couple more interior walls. It worked part of the time but was an "on and off" situation so I purchased two of the Pro cameras and they worked fine at that distance. The cameras are very sensitive to motion but by setting the sensitivity to a "1" or "2" and doing some mapping (a great feature) you can make them work very well. All in all, it is a great system but don't expect the range that is stated unless you are in wide open spaces with nothing in between. Easy to use, worked like it was supposed to. I purchased this about a month ago. Set it up in my living room, moved it outside after pairing and everything came on with no hassles, menu was easy to navigate. The unit was easy to set up. There were a couple of concerns with the manual. The manual states there is 65ft of cable but the wireless unit is far less then that - on the order of 25ft so when you plan to install the cameras make sure you can get electricity to them. The cameras are stated that they can view 75ft at night I could not get that far but the unit would be great for indoor application. The outside night time viewing is much limited. the cameras viewing angle much less requiring more cameras to cover a given area.. The day viewing distance is great and the angle of view is great. The unit has a lot of capability you have to fool around with it because the manual is vague in some areas. You don't get a hard copy of the manual which was a pain since you have to go back and see how the unit works. Little things like putting a name to a camera is a little tricky at fist. The manual skips telling you that you have to delete the camera number first using the key board delete key. Also resolution levels are not clearly defined and some of the features on the search routine are not explained such as the little man figure - I still have not figured that out yet. The actual unit is first class from a performance point of view. Defender could make it a lot easier for you by improving their manual and providing a hard copy of the manual.